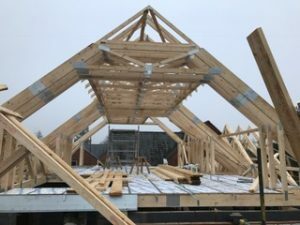 We’ve recently completed a project to provide complex attic trusses to a client in Moulton. The project was a 4-bed chalet using attic trusses throughout with complicated interactions between roof lights, dormer windows and the stairwell. The trusses also exceeded the safe transportation limits so were manufactured in two parts. Careful consideration was given to the two-part trusses to ensure that labour and scaffold costs would be kept to a minimum for Mr Keyes. The Gang Nail software was able to produce very useful 3D images for Mr Keyes to pass to his carpenter to help plan the sequencing of the construction as well as visualising the options for a ridge roof light to provide light to the kitchen area. This entry was posted in News from Robinson Manufacturing, Product Features by Robinson Manufacturing, Recent Projects, Self Build. Bookmark the permalink.